April « 2016 « Geekorner-Geekulture. Let’s start with the “perfect shot” from this episode (NSFW-ish). Just so pretty. 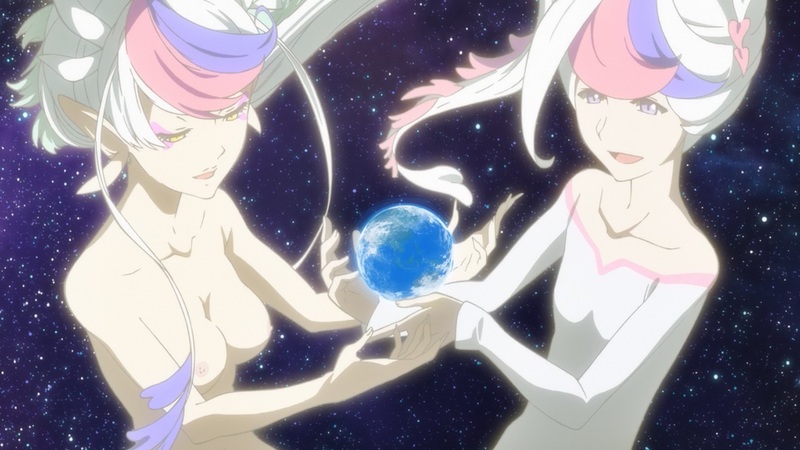 It’s also saying a lot that these two are holding the Earth in their hands so lovingly, because they love the Earth, even as they are forced to abandon it. The past still have power, but it’d be a mistake to overstate it. 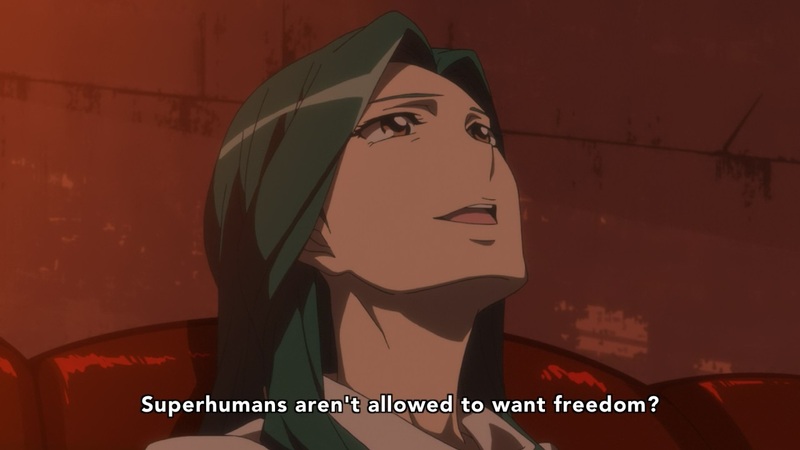 This is a continuation of last week’s episode of modern humanity in general, and Japan in particular, renouncing their past, renouncing their obligations to the world and to its inhabitants. You’ll note how Devilo says “introductions are etiquette where I come from,” we are told they’re as much “devils” as yokai, and then you realize there might be some pacts being broken here. Also, “The Pied Piper of Hamelyn,” right? He only led the kids astray when the deal that was made with him wasn’t upheld. Same here. The original title for this piece discussing Snow White with the Red Hair (Akagami no Shirayuki-hime in Japanese, and “Akagami” in this piece from now on) read as “Transgressively non-Transgressive Shounen Romance?”, but as “transgressive” is not a wide-spread word, I opted for readability. But this piece needs some unpacking of terms, which will be brief. “Shounen” and “Shoujo” are demographics, with “shounen” referring to young boys and “shoujo” referring to young girls. How do you know a series’s demographics? You look at the publication where it’s released. This also means that over time “shoujo” and “shounen” have grown, at least in the west, to mean certain genre conventions. Though this is “wrong”, this colloquialism is what this piece will use (I wrote about anime/manga demographics before). As for “transgressive”, we’ll get to that soon enough. 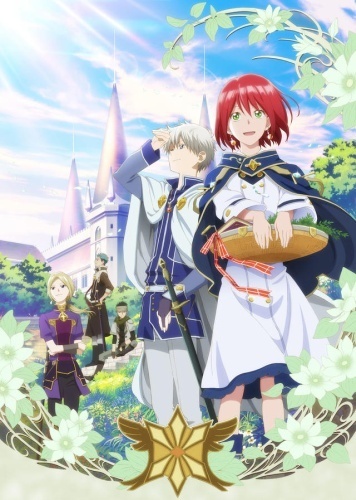 Akagami’s anime adaptation ended its second season recently, and after watching it, I thought it is as shoujo (remember: aimed at younger girls) as they come. It’s serialized in a shoujo publication (LaLa DX), it centers around a super-capable commoner heroine, it has a love at first sight encounter in its very first episode, with the super-capable and handsome prince, and the show has all the necessary associated sparkles for the lovey-dovey sequences, balls, gowns, declarations of eternal love and loyalty and not a lot of romantic conflict or plot-progress and external conflict (we’ll get back to this). 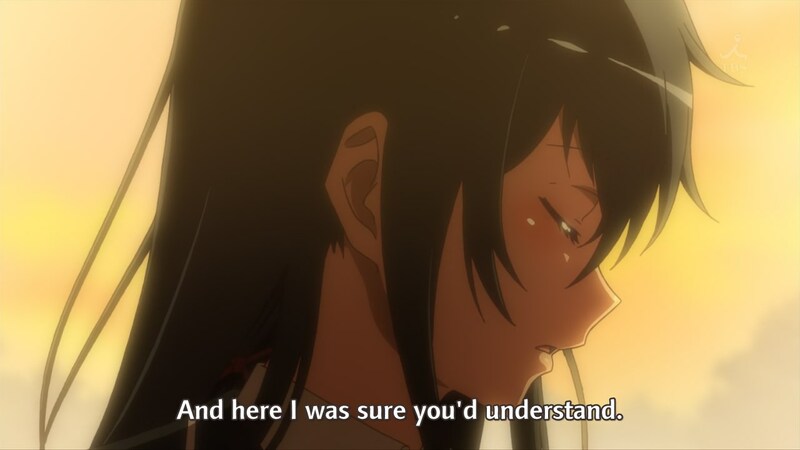 And yet, watching the second season something suddenly became apparent to me: This quintessential specimen of the shoujo genre conventions might actually not be one? 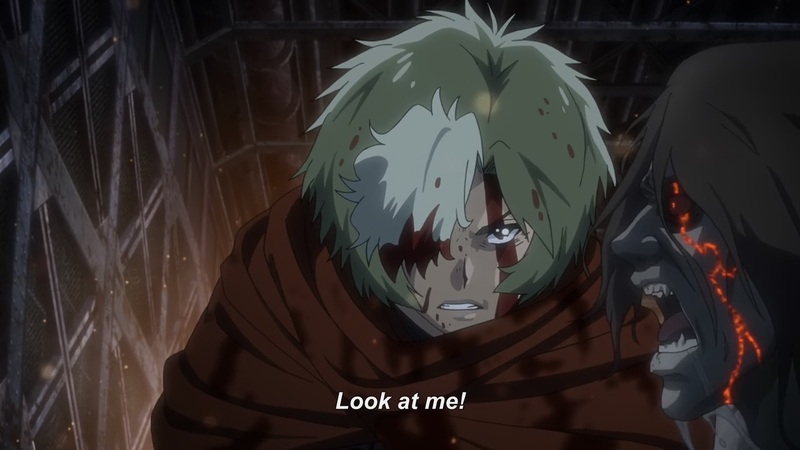 Before anything else, I want to make it clear that I had a lot of fun watching the last episode of Kabaneri, as well as the first. It’s propulsive, and full of funny moments. Are all of them supposed to be funny to me? I doubt it, but some are, and I’m never laughing at the show too hard. And yet, I’m going to focus on some of the things I did not like, because the things I do like are mostly about pacing and direction and general atmosphere, or just the very subjective feeling of fun I’ve had. There’s not a lot of words for me to say about it other than to just say it is so. But when it comes to the episode’s writing, and some meta-concerns related to that, which I liked considerably less, I actually have a lot of words to say. So, keep in mind that I’m enjoying the show as you read what is to follow. Somewhere between the two, Ikoma and Takumi are such dorks. Such fun goofballs. Hollering and clasping over their successes. 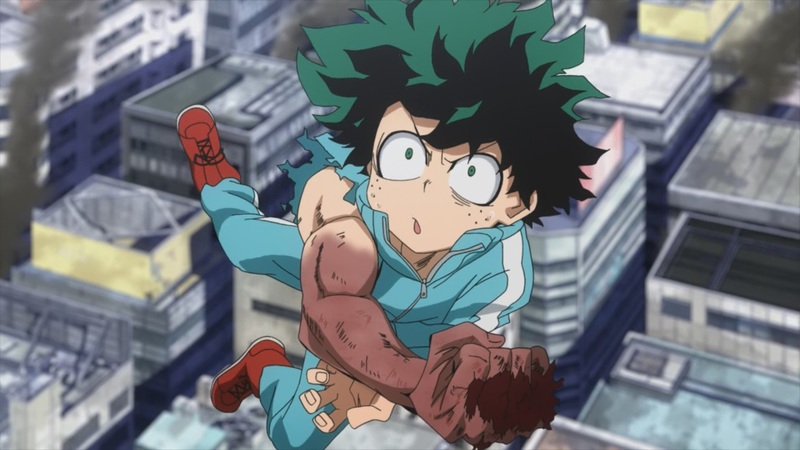 No, it’s not funny that they do, but how they do it is almost straight out of a shounen manga. But from that we go onto just how dumb Ikoma is sometime. Or rather than dumb, he does things without relaly thinking them through. Last week we had him cutting his hand to draw the Kabane without thinking through of how it’d hurt, and let’s not return to the auto-asphyxiation scene. Did we really have an episode with zero time-skips? I guess we did. So, let’s talk about what this episode has been about, which is two things, the first of which I’m surprised I didn’t see coming, and that’s sports. The second is the relationship of the past and the present. So, sports. 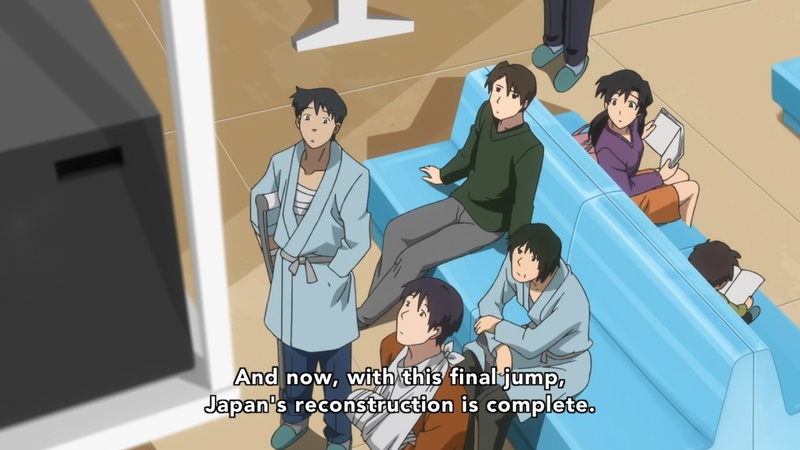 This episode’s historic event is the 1972 Sapporo Winter Olympic Games. Sports are an obvious topic to discuss when it comes to military, national pride, and the tension between nationalism and individuality. Wars have started over football in the past. Wars and hostilities have ceased for the sake of athletic competitions (and this is part of the legacy of the Olympic games in ancient Greece. And fascist regimes have, just like democratic ones, used these events to try and bolster national pride. All of these have very much been at the forefront here, which will be more relevant as we go into the second part of the episode.